Kirk Newkirk started what is now Key Sailing in 1974. "It opened up as Kirks Catamarans on the very location we are at now. In 1974 I had never sailed a Catamaran and so figured with a name like Kirks Catamarans I should probably learn, and learn quickly! We started with paddle boats, Sunfish, and Venture Catamarans. I soon discovered Hobie Cats as well as NACRA and Prindle catamarans and ended up being the Prindle dealer and got into racing and enjoyed it. Later we got the NACRA dealership as well as the Hobie Cat dealership." 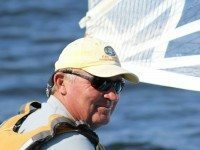 Kirk has numerous national sailing titles as well as U.S. Multihull champion. Started renting jet skis in 1981 and then waverunners in 1987 when they first came out.